VTT Technical Research Centre of Finland has developed a process that enables recycled paper and cardboard to be used as a raw material for nonwovens. 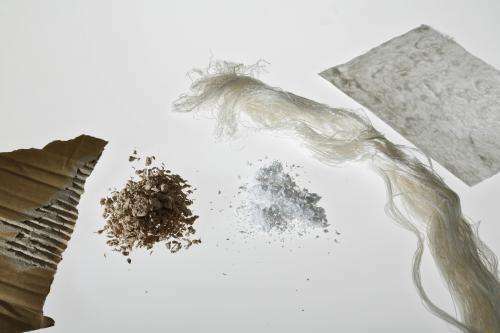 Hygiene and home care products, such as nappies, sanitary towels and cleaning cloths, are among the many items that can be manufactured from the biodegradable nonwovens. The manufacturing costs of cardboard-based nonwovens are around 20% lower than for nonwovens produced from wood raw materials. The forest industry will be among those likely to benefit from new business opportunities opened up by nonwovens based on recycled paper and cardboard. Nonwovens are essentially consumer goods that once used will end up in a landfill site along with other community waste. In the metropolitan area alone, an estimated 10,000 tonnes of nappies and sanitary towels are disposed of each year. The principle raw material in nonwovens manufacture is biologically non-degradable polyester. Up to now, market entry for bio-based nonwovens derived from wood has stalled because of prohibitive production costs. 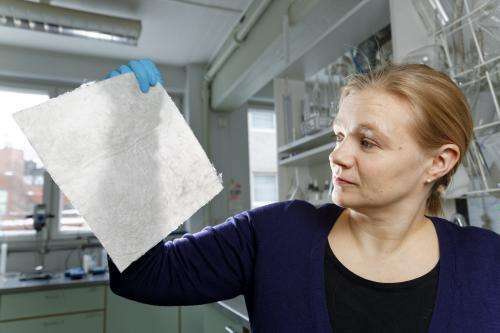 "Now for the first time we can make use of recycled paper and cardboard as a nonwovens raw material," says Ali Harlin, Research Professor at VTT. "The new process means that bio-based nonwovens are now more competitive on price in comparison with plastic-based products. The manufacturing costs of cardboard-based nonwovens are around 20% lower than for nonwovens produced from wood raw materials. New business opportunities should open up fairly rapidly, since the technology required for manufacturing nonwovens from recycled materials is already in place." Every year Europe generates around 60 million tonnes of recycled paper, of which cardboard makes up around 40%. The demand exists for new applications and technology for exploiting recycled paper due to the EU's objective of raising the proportion of recycled paper to 70 per cent. The method developed by VTT could extend future possibilities for re-use, particularly in the case of cardboard, which is more cost-effective as a raw material than fine paper. Cleansing the cardboard of filler material, lignin and hemicellulose is a key part of nonwovens manufacture. VTT has matched several fibre-processing methods in the preparation of dissolving pulp to assist in obtaining pure cellulose from the recycled cardboard. The dissolving pulp produced in the research project was regenerated using VTT's patented carbamate technology, which is safer and more environmentally friendly than the traditional viscose process. The nonwovens were manufactured with foam forming technology that uses little water. Around 1.9 million tonnes of various types of nonwovens were manufactured in Europe in 2011. Strong growth in the global market for nonwovens is forecast to continue for the foreseeable future. Apart from hygiene, health and cleaning products, the nonwovens have further applications in, among others, the construction industry.